The “Teach the Text Commentary Series” was commissioned to help the busy pastor and to fill a void in commentaries that are both scholarly, and yet practical. The aim is to present the “big picture” of a biblical book by dividing it “into carefully selected preaching units, each covered in six pages” (p. ix). There are 5 main areas of focus within these 6 pages: 1) Big Idea; 2) Key Themes; 3) Understanding the Text (this is the longest section including such subjects as context, outline, historical and cultural background, interpretive insights, and theology); 4) Teaching the Text; and 5) Illustrating the Text (pp. xi-xii). It is important to keep this structure and the necessary restrictions in mind when evaluating each commentary in this series. Such an approach is clearly not intended to be exhaustive. So is there room for a commentary series with this more generalized approach? I believe there is. My own classroom teaching experience has demonstrated to me the need for students to gain the “big picture” of a biblical book. It is important to be able to summarize the main themes and key ideas of a book. Oftentimes people read or study a biblical book and have no idea of how to summarize its main message(s). The “Big Idea” and “Key Themes” features of this series go a long way in aiding the reader to achieve this goal. Therefore, the structure of the Teach the Text Commentary series is not only helpful to the pastor, who may be consulting it for his weekly sermon, it is also beneficial for the beginning student. 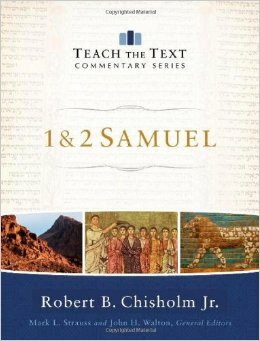 Before making specific remarks on Chisholm’s 1&2 Samuel commentary, I would also like to add that the “Teach the Text Commentary Series” is attractively presented. Each hardback volume is printed on heavy-duty paper which is ideal for the many helpful maps, photos, and illustrations contained in each commentary. Chisholm begins his commentary on 1&2 Samuel with a brief 7-page introduction. He summarizes these books by noting the three main characters (Samuel, Saul, and David) and by stating, “David is the focal point of the story” (p.1). Saul acts as a foil to David, while “Samuel’s support of David becomes foundational to the narrator’s defense of David” (pp. 1-2). The high point of the book is the Lord’s covenant with David, securing his dynasty and proving faithful even in the midst of David’s sin. Chisholm divides 1&2 Samuel into 7 sections based on “its major plot movements, revolving around the theme of kingship” (p. 4). His outline is as follows: 1) Prelude to Kingship (1 Sam. 1-7); 2) Kingship inaugurated (1 Sam. 8-12); 3) Kingship Fails (1 Sam. 13-15); 4) Kingship in Limbo (1 Sam. 16-31); 5) Kingship Revived (2 Sam. 1-10); 6) Kingship Threatened and Preserved (2 Sam. 11-20); and 7) Epilogue (2 Sam. 21-24). One potential weakness is that this outline is not clearly delineated in the commentary that follows. Perhaps Chisholm’s reason for ignoring this is because he does not find “clear-cut structural markers” in the text (p. 4), but sees the divisions above as related to plot development. Two characteristics of Chisholm’s exegesis that I found particularly helpful include his attention to certain words, and parallels and/or contrasts between biblical characters. Chisholm does an excellent job of paying attention to words or phrases found in 1&2 Samuel and demonstrating their connection with another incident in 1&2 Samuel (or the Former Prophets, meaning Joshua-2 Kings). For example, he notes that the expression “terror filled his heart” in 1 Samuel 28:5, in reference to Saul, only occurs one other time in 1-2 Samuel. It is found in the story of Eli’s demise as his “heart trembled over the fate of the ark of God” (p. 184). This kind of verbal connection suggests the author is comparing the circumstances of Saul and Eli. Similarly, Chisholm frequently points out similarities between incidents or characters in 1&2 Samuel with other biblical characters or incidents. One example is the similarities between the actions of Absalom in 2 Samuel 13-14 with Abimelech in Judges 9 (p. 252). 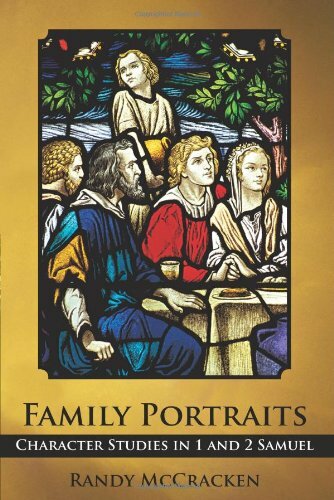 This attention to biblical typology is extremely helpful when interpreting a narrative text (see my discussion in Family Portraits, p. 11). Perhaps the greatest challenge in writing a commentary of this kind is providing illustrations for the text. This is certainly a subjective task. Certain illustrations will ring true with some, while others will find them unhelpful. While I would not endorse the use of every illustration suggested in this commentary (and I’m sure the author would not expect me to! ), I do believe that Chisholm has done an admirable job in handling a difficult task (Another insight I learned from the interview with Chisholm was that he wasn’t responsible for any of this material). The editors themselves point out that this section of the commentary is intended to provide “general ideas” and to “serve as a catalyst for effectively illustrating the text” (p. xii). In conclusion, Chisholm’s commentary achieves the aims of this series admirably. He is a scholar of high caliber and is a well-established expert on the entire corpus of the Former Prophets. Pastors, students, and others wanting to become grounded in the message of 1&2 Samuel will benefit greatly from this commentary. I used it for my own 1&2 Samuel class this past semester and will continue to do so in the future. I heartily recommend it to others. (I am grateful to Baker Books for providing this copy of 1&2 Samuel, Teach the Text Commentary Series, in exchange for a balanced review). Hey Randy, this was a great review! I’m just writing mine for Marvin Pate’s Romans commentary in the same series. Thanks Lindsay. I’ll look forward to seeing what you have to say about the Romans commentary!